When you're touring apartments looking for a new home, it's easy to get caught up in stunning views and modern decor while losing sight of the everyday realities of living. What seemed like a dream apartment can be more of a nightmare if you're faced with a limited number of power outlets or windows and doors that don't lock. We've put together a list of important features you should always check when evaluating an apartment, and what you should check when you move in. Most states have enacted legislation on mandatory installation of smoke and carbon monoxide detectors in private homes and apartment communities. If you don't see them, don't be afraid to ask the property manager. Keep an eye out for general signs of shabbiness such as carpet stains or window blinds that don't work. If the leasing agent assures you these issues will be fixed, get it in writing. However, if the grounds are untended, odds are that it's a regular problem and not a chance occurrence. This may be the feature that is most often overlooked, and the one that can ultimately cause the most frustration. 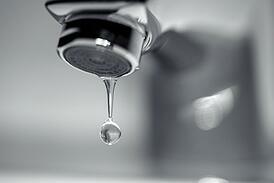 Turn on the bathroom and kitchen faucets and run the shower to see if the water pressure is at an adequate level. While you’re at it, turn on the hot water to make sure the water heater is working properly. As long as you're turning the water on, go ahead and check the other utilities and appliances. Flip light switches off and on, activate the heat and the air conditioning, turn on the oven and the stove burners, and see if the refrigerator and freezer are appropriately cold. With big-screen TVs and other audio-visual equipment as well as tablets, laptops and cell phones that need to be charged, plentiful electrical outlets are a necessity, and don't forget to check the kitchen and bathroom. Once you move in, take the time to check all the outlets. It may seem like a tedious job, but it will certainly save you frustration once you get all of your belongings moved in. This is a feature you can't afford to overlook, or you may not discover until it's too late. The front door and all windows should have secure locks in working order. Locks on interior doors should have a mechanism to open them in case they are accidentally engaged. Check them all when you go through your move-in inspection. Our Springs Apartments communities are designed and maintained with resident comfort, safety and satisfaction in mind. With an on-site management team and 24/7 maintenance service, you can be assured that we will always uphold our excellent standards.